This piece was the first to catch my eye. 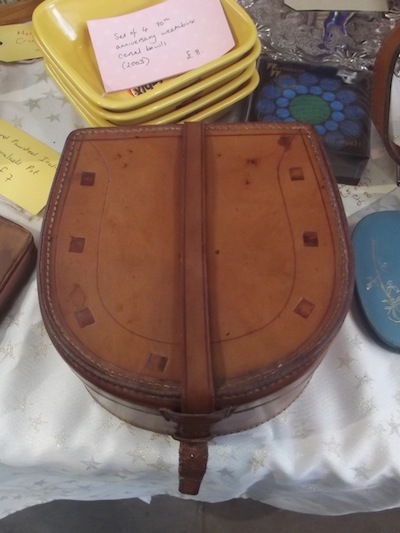 It is a lovely gents collar box dating from around the mid 1930s. Normally found in a plain and quite boring round shape. The horseshoe shape makes this very desirable and it shouts quality and style and would enhance any stylish gent's dressing room. A very reasonable £15. I spotted these first thing in the morning when setting out our stall. Annette of Sheila's Store has her pitch opposite us so I couldn't really miss these. They are beautiful prints dating from the 1970s and very large compared to the normal ones that are seen at fairs and boot sales. 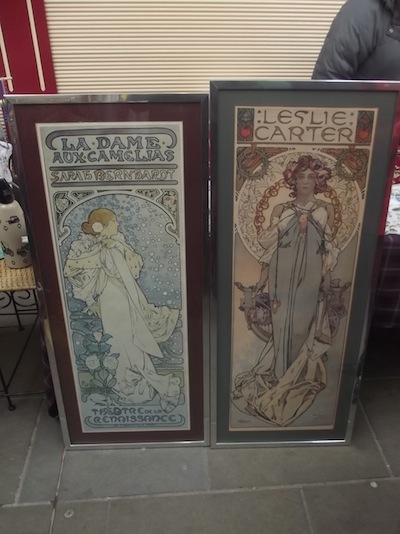 We first bought Alphonse Mucha prints and mirrors back in the early 1970s from a great shop in Crewe called Galley One. The shop is long gone now but it stocked all the trendy 70s decor and furniture one required for that uber trendy house. These two prints now adorn the stairway of our house and look very nice. At a reasonable price of £50 for the pair. I love them. This one also brought childhood memories. A mechanical game operated by winding a handle to progress the horses forward to the winning line: the winner is always random. A great game dated 1965, which I could see finding an appreciative home in a study or shed. A good party game with maybe a couple of side bets. I was drawn to this because of another friend who has an interest in vintage cameras and equipment. The timer would be placed in a round tank and you would turn the dial to set the developing time required for the film. Although the actual immersion tank was not with the dial it was still a quirky piece and would display well among the cameras. I had to get it for my friend and paid a very nice price of £2.50. Hopefully my friend will love it. If not, hey ho! 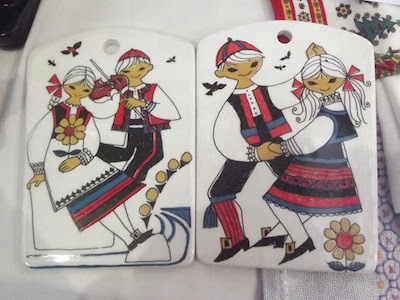 I first saw these two brooches when we stood at our first Vintage Village. I loved them then and still love them now. 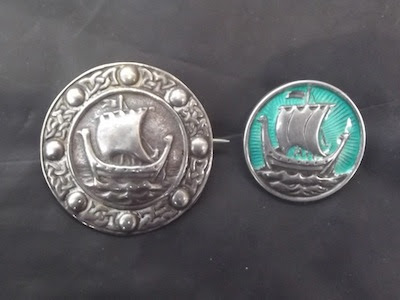 One is silver and the other is silver and enamel, and they are decorated in the Iona Style of Alexander Ritchie although not by Ritchie. I love Celtic silver and will probably end up buying these eventually, maybe at the Christmas Vintage Village. However I failed to ask Anne of The Side Room the price. Silly me. Regular Vintage Villagers will be very familiar with our Finder this month! He's one of our most well-informed traders, a Northern Soul nut and a soon-to-be TV star! Let's allow him to introduce himself . . .
Hi. Welcome to my Finds of the Fair from The Vintage Village Glam Pop Fair on Sunday 11th November 2012. I will start with a little introduction: my name is Andy - co-partner, with my wife, Sharon, of Dabberdecades. I have had a passion for antiques and collectables for over twenty years: buying, selling and collecting, with a love of ceramics and glass and more recently vintage clothing and homewares from the 1950s, 60s and 70s, with a particular slant on noted designers of the periods. I am also renowned for doing my research on items that I have a 'feel' for - just ask Sharon! However research does pay off. I have a wide ranging knowledge of all things antique and collectable and, along with Sharon, have recently competed in a TV programme on antiques and collectables to be aired in January 2013. Watch this space to see how we fared!! Well enough about me. Lets get on with the business of my Finds of the Fair. Hope you like them. This also caught my eye on the same stall. I used to love playing Subbuteo in my younger days and this just brought back memories. As I said in my introduction. I have a passion for glass. These three pieces of glass were just stunning. The small dimple pattern was a piece of Ingrid Glass: with a price tag of £48 it was very tempting. The larger blocked vases were by unknown makers but probably Scandinavian and they were also very tempting, priced at £68 and £48. Very nearly bought them all but managed to hold myself back. It was nice to talk with Naomi, the stall holder, as she was very knowledgeable about all her items on the stall. It was a stall full of what I like. I'm glad to see Von Kitzen make their Vintage Village debut. On seeing these I thought about friends of ours who are in the printing game. These letters would look great displayed, as photographed, on their side. Duncan from Wax Delerium was the seller and there were four boxes available at £2.00 each. A bargain by any standards. Now these really brought back some childhood memories! When I was around 11 years old my Dad had a Mark 1 Cortina in eggshell blue - I would love to have it now - and it was his pride and joy. Weekends were always spent going somewhere in the car with my dad and mum. Sunday afternoons with dad and mum all dressed in their Sunday best with my Dad wearing his car coat and a pair of these gorgeous gloves. I used to put them on when I got the chance and still love driving gloves to this day, although I do not wear them when driving . . . These were again a bargain at only £8. Someone somewhere will love these and use them for their designed purpose. This was a very poignant find given the date of the fair [editor's note: it was Remembrance Sunday on the day of this fair]. A Flanders card dating from 1917. This brought home to me the fact that the person who sent this or brought it back from France must have gone through a very rough time, and, having served in the forces myself, I understand what he or she went through. This was being offered by Foxy Antiques at a very affordable £5. Not a rare find as the troops sent hundreds home but it still makes you think about them. Last but not least I noticed these two Norwegian wall plaques. As you know from my intro I have a love of ceramics and the simplicity of these had me hooked. Sue from Levy Delights was the owner until I put my hand in my pocket and parted with a very reasonable £9 for both plaques. Not found a place to put them yet but I'm working on it. I would like to say thank you to The Vintage Village for giving me the opportunity to carry out the duties of Finder of the Fair and I congratulate all the previous Finders as it is not an easy task. Happy Vintageing!! Thank you Andy for composing such a fascinating and varied range of Finds of the Fair. And we're very glad to see you keeping up the worthy tradition of taking a few home yourself! Andy and Sharon have been sworn to secrecy about their forthcoming TV appearance, but we will be sure to let everyone know about it, just as soon as we know about it.